Rosy periwinkle (Catharanthus roseus) has the property that can cure and prevent breast cancer. The results showed that the virgin footprint contained 2 vinca, vincristine and vinblastin alkaloids. Both of these compounds play an active role to inhibit the development of cancer cells in the body. So it does not necessarily damage other normal cells around the growth of cancer cells. 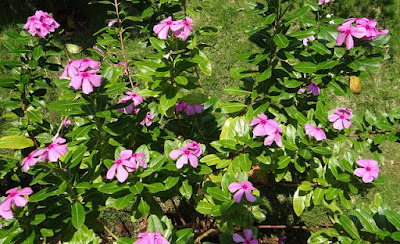 In Sumatra, the leaves of Rosy periwinkle is better known as alang grass. In addition to treating breast cancer, this leaf is also useful for the treatment of bronchial cancer and other malignant tumors. To make it quite easy, provide 22 leafs of Rosy periwinkle, bark of pulasari and fennel fruit. Boil all ingredients with 3 glasses of water while sprinkled with brown sugar to neutralize the bitter taste. Wait until the remaining water in half, lift and filter the drink. Consume it routinely for a month as a treatment. There is two kind of turmeric, first one is white turmeric (java: gombyok or pepet). Turmeric of this type efficacious cure diarrhea or dysentery, while the second is mango-colored turmeric. This type is used by herbalists as cancer and tumor treatment. This cancer drugs, known to contain Ribosome Inacting Protein (RIP), anti oxidant, and curcumin. RIP is a nutrition that can kill cancer cells without damaging the surrounding tissue. While anti-oxidants play a role of gene damage and curcumin can act as an anti-inflammatory or inflammation. The benefits or this herbs also turned out to vary, ranging from treatment of liver cancer, breast, cervix, lungs, and heart and cholesterol. 1 teaspoon of white turmeric added with 100cc warm water. Apply this herb, then drink the water only. For treatment, it's good to consume as much as 3 times a day (morning, afternoon, and evening). As for prevention, can consume 1 time a day before bed. Do it regularly for maximum results. Coffee parasite plant has been known by the ancestors of the Chinese nation and people in the Batak area has good benefit for our healthy. Coffee parasite plant contains high antioxidants that useful to rehab your body from cancer by suppress the growth of cancer cells and help the growth of healthy cells.Chinese people usually use coffee parasite plant to cure diabetes and cancer. For cancer treatment, you can use this plant in form of fresh or drying without exposure to sunlight. The coffee used should not be exposed to pesticides or contaminated with other chemicals. You can drink coffee parasite plant as brewing tea. The second way is to boil the leaves of coffee parasite plant. The third way to process the parasite of coffee in the dried condition. Drink this herb every day. Drinking this tea is very good to support drug during chemotherapy (therapy using anti-cancer drugs). Rodent tuber is a scientific term for rat rats that are efficacious to stop and treat cancer as a whole. How to use this cancer herbal plant is quite easy. Soak the plant for 30 minutes 3 rod taro rods and leaves, approximately 50 grams. Mash until smooth and squeeze rod taro rats. Perform filtering and consumption on a daily basis. This one plant has been known as anti-cancer long before long before modern medicine developed. Anti-cancer ingredients derived from the leaves of the god, can be racik own in the kitchen favorite. - First of all, provide 30 grams of fresh god leaves, 20 grams of white ginger, 30 grams of jombang. Boil all the ingredients together with 600 cc of water, wait until the water is left half. Then strain the cooking water to be consumed essence every day. - There are another way to make leaf of god potion, provide 30 grams of fresh god leaves, 30 grams of fresh tapak dara leaves, 30 grams of pearl grass, 30 grams of snake tongue grass. Put all the ingredients together 1000 cc of water, then boil until the water is half left. Filter all ingredients and add honey to neutralize the bitter taste, just enough. Stir the concoction and consumption while still warm. So much research done to know the benefits of noni fruit. Even some world health companies began to produce mengkudu fruit extract. Noni fruit known to contain dammacanthel or anti-cancer compound. These compounds plays an active role against abnormal cells when entering the pre-cancer stage and rehab your body tissue. Not only that, dammacanthel also efficacious to prevent the development of cancer cells. It is easy enough to make this anti-cancer herb, squeeze 2 or 3 Noni fruit. Add a few drops of honey to add a delicious flavor to it. Drink noni fruit extract every day. It is better to choose half ripe mengkudu, to avoid high levels of alcohol. Cermai or Goosberry is a high Vitamin C fruit, maybe because of its sour taste, Cermai only known as a pickled fruit. Leaves of ceremai (Phyllanthus acidus) actually can be used as an anti-cancer drug. Wash the leaves of the ceremai, leaves starfruit, upris ladies, chinese gadung until clean, then mix it palm sugar. Boil with 3 cup water until it left ¾ cup, chill and strain it. Drink this potion 3 time 1 day as much as ¾ cup. Now you know some herbal plants as a cure for cancer and how to use it? Try to mix it by yourself all the ingredients in your own house for cleanliness guaranteed.